iolo is continually developing and innovating tools necessary to keep your computer running at its full potential. System Mechanic 11 Pro breaks new ground with a combination of patented technology, expanded controls and enhanced intelligence that can advance your computer’s operation beyond even the toughest performance barriers. New real time technology speeds PCs by optimizing critical file transfer activity. New technology to identify and block the latest emerging malware threats. More System Horsepower Multiple startup optimization and resource boosting advancements. System Mechanic’s performance focus is the perfect match for Microsoft’s new operating system. Comprehensive solution: Performs an automated 229-point full service computer diagnostic exam. Independent lab proven: Multiple 3rd party experts prove System Mechanic works hard to improve PC speed and reliability. Science-driven power: Uses iolo Labs’ research data to automatically fix over 30,000 different types of problems and errors. A wise investment: Makes old PCs run like new again and keeps new PCs running smooth, avoiding headaches and premature replacement costs. The expert’s choice: Consistently ranked most effective in improving PC performance by independent test labs. Patented automatic maintenance: iolo’s patented ActiveCare technology automatically maintains your PC while it isn’t being used. 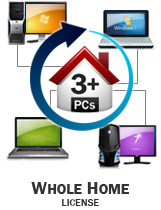 Unlimited home license: iolo’s breakthrough Whole Home License allows use on all your home PCs. Compatible with all versions of Windows: From Windows XP to Windows 8 and beyond, iolo ensures its products are always on the cutting edge. New real-time technology that optimizes file organization on both solid state drives (SSD) and traditional hard disk drives (HDD). Working deep inside the Windows operating system, it minimizes the degree that a new file, or changes to existing files, will be stored inefficiently. 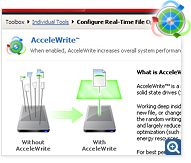 By minimizing the random writing of data, AcceleWrite increases overall system performance and largely reduces or eliminates the need to perform secondary file optimization (such as disk defragmentation), saving your system time and energy resources and helping prolong the life of your PC. 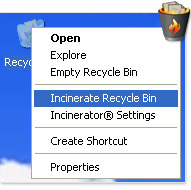 Start Windows significantly faster by eliminating unneeded or hazardous start up programs safely. 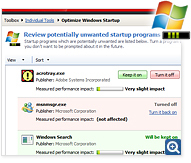 Startup Optimizer is now expanded and even more simplified and delivers extra system horsepower at your command. Technology refinements now make it easier to achieve accelerated system startup speeds while precious resources are injected back into active programs and tasks throughout the day. New advancements in System Mechanic 11 coupled with ongoing research from iolo Labs result in broader startup coverage. Now it’s easier than ever to identify and root out unwanted programs that silently leach horsepower from bootup and other high priority activities. Version 11 is fully designed to effectively fix, optimize and maintain Windows 8 with added options and underlying research to keep the latest version of Window firing on all cylinders. You can now use the System Mechanic 11 award-winning features on all Microsoft operating systems from Windows XP forward. iolo’s multiple-lab certified virus, rootkit, trojan and worm protection includes even more effective defense technology designed to identify and neutralize the latest threats to your PC. With enhanced memory processing, heuristic pattern matching, and even better resource usage, you can safely work and play online both with security software that stays out of your way. 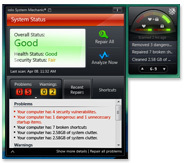 System Shield’s performance-focused malware protection packs a powerful punch in a light footprint. System Shield technologies are engineered to provide outstanding antivirus and antispyware protection, working quietly and efficiently, without slowing your PC down like other security products. Backed by the industry’s leading security labs (ICSA, VB100, and WCL/Checkmark), System Shield delivers up-to-the-minute protection while staying out of your way with no gimmicks, no bloat, and no slowdowns. 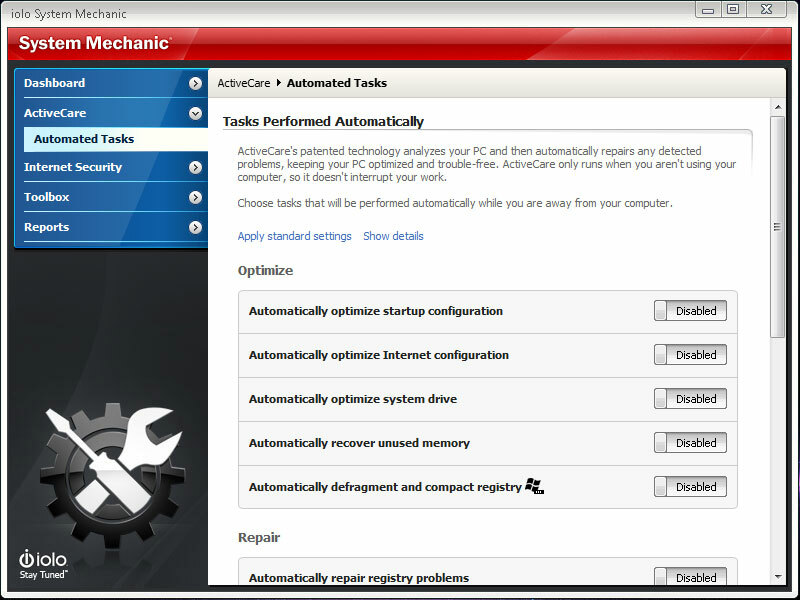 One of the many industry-first innovations included in System Mechanic, ActiveCare is now easier than ever to configure, with setup profiles that allow you to apply one-click maintenance options to your entire PC without the guesswork. System Mechanic’s exclusive idle-time optimization kicks in when your PC isn’t being used and releases full control when you return — so your system always stays ready for action. By silently tuning, fixing, and cleaning as needed while you’re away, you’ll have a faster and healthier PC without experiencing foreground maintenance activities that can bog things down. Other products blindly schedule maintenance at specific intervals whether they’re needed or not, and ignore operation-jamming problems that arise between scheduled events. ActiveCare transparently and intelligently keeps your PC running optimally so your system always runs at peak performance levels. Device drivers are files filled with critical information that instruct your computer and the devices connected to it how to operate together effectively. All of the hardware on a PC—from the keyboard and mouse to the CPU and Wi-Fi adapter—require an up-to-date driver to keep them in good working order. Because they perform such essential tasks, keeping your drivers updated and in good working condition is central to ensuring your PC’s overall stability and performance. However, the process of manually updating drivers can be frustrating and time-consuming. Designated Drivers™—lets you update all of your PC’s drivers with just one click, now making driver updates a painless process. Designated Drivers is the only tool of its kind to exclusively use Microsoft-approved driver updates, which have gone through two rounds of quality assurance testing to ensure the updates are safe, reliable, and broadly compatible. Although solid state drives (SSDs) enjoy a significant speed advantage over traditional hard disk drives, it doesn’t mean they are impervious to slowdown or degradation over time. 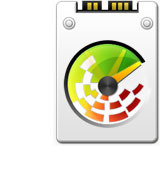 With regular, everyday use, many users have found that these drives begin to suffer from incremental performance loss. To resolve this problem, iolo’s engineers designed SSD Accelerator™ to proactively optimize solid state drives to keep them running at the peak of speed and efficiency. 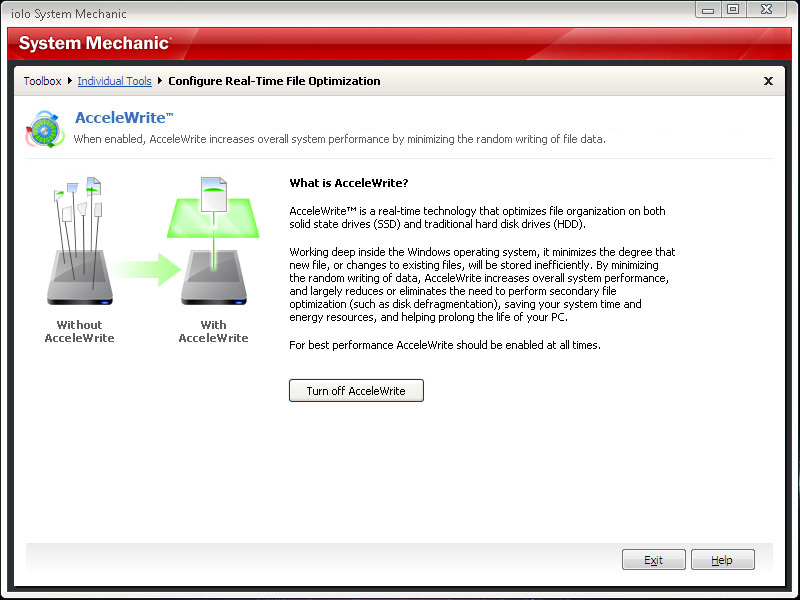 SSD Accelerator has also been designed to work together with System Mechanic’s other drive optimization tools such as AcceleWrite and ActiveCare technology in order to ensure that all of your data storage drives are automatically optimized for maximum performance and longevity on a regular basis. 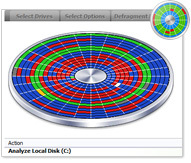 Disk defragmenters can make it worse, blindly compacting and separating related files even more. 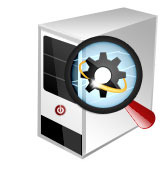 Bottom line: Program Accelerator jump-starts your sluggish programs by fully re-aligning your whole PC file system. 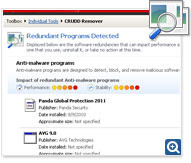 Commonly Redundant or Unnecessary Decelerators and Destabilizers (CRUDD) Remover™ helps identify and eliminate duplicate programs that overload your system. 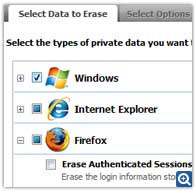 In addition to all the programs you install yourself, there’s the software that came with your PC that you may never use, as well as any number of programs that may have installed themselves on your computer without your knowledge. 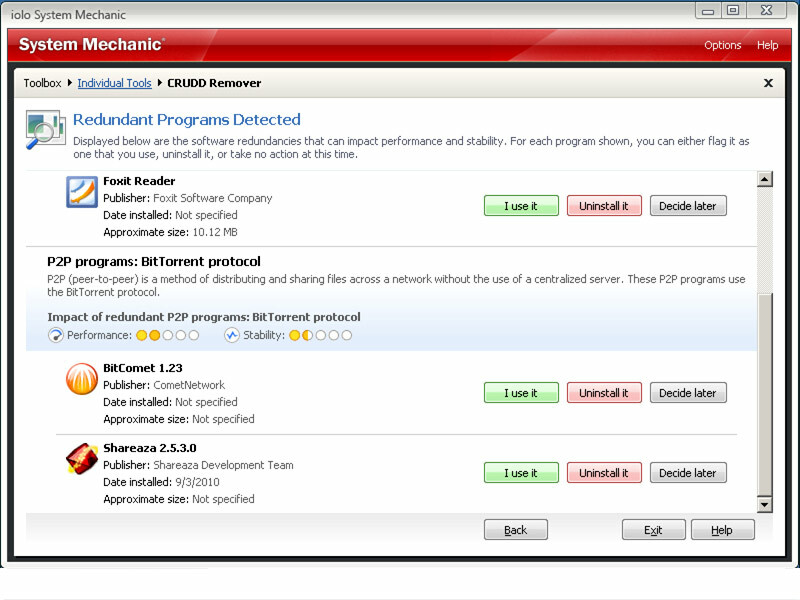 Removing unneeded programs is one of the best ways to significantly speed up a PC. The CRUDD Remover’s™ expert intelligence takes the hassle and guesswork out of finding, classifying, and presenting them all, so you can choose to remove unnecessary software bloat. Today, most homes have multiple computers. Trying to keep track of the number of software license activations allowed across all machines can become complicated and frustrating, as well as costly. Get more performance and more value with the first-ever software license that lets you use it on all your home PCs, no matter the number. Gets you back on the web without delay! We’ve all experienced the frustration of being abruptly disconnected from the internet — usually right in the middle of something important — even with broadband. 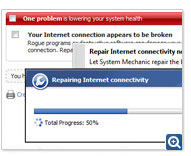 System Mechanic’s new Internet Connection Repair technology detects bad connections and uses a regimen of proprietary technology to not only repair and reconnect your computer, but also ensure the connection is as clean, fast, and reliable as possible. It’s the first technology of its kind and a critical part of System Mechanic’s automatic weekly intelligence updates. iolo Labs is continually studying and classifying new and changing threats to PC performance. Tune-up Definitions™ allow System Mechanic to individually tailor its diagnosis, repair, and optimization tools for each unique PC configuration, providing personalized solutions to emerging performance threats using ActiveCare technology. System Mechanic is now fueled by well over 30,000 independently identified solutions to common issues that arise from everyday use. This makes all the tools and functions that rely on this crucial data more effective than ever before. 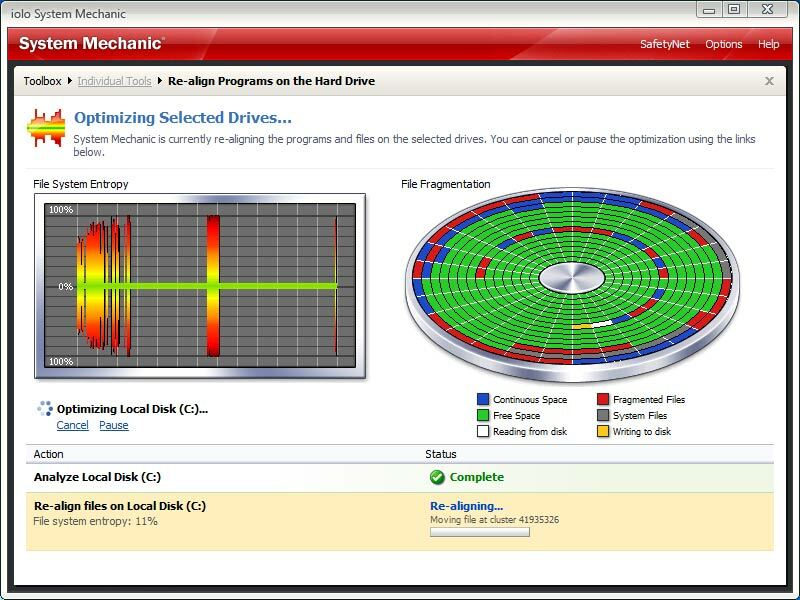 System Mechanic Pro’s fast and powerful disk defrag tool is now engineered to work hand in hand with the patent-pending technology of Program Accelerator™ and AcceleWrite™ to completely optimize your hard drives and critical data for speed and reliability. Perfect for gamers, video and sound engineers, artists, web designers… or any serious computer user who requires an instant shot of raw, fast, focused performance. 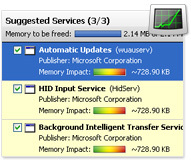 Frees up and maximizes system memory and CPU resources to give Windows additional horsepower. 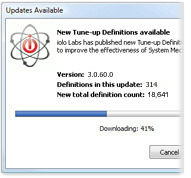 Uses iolo Labs’ Tune-up Definitions and user-defined profiles to identify background programs and services that can be temporarily shut down. 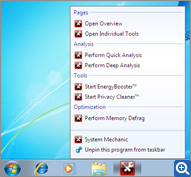 Integrates all of System Mechanic’s powerful registry tools to provide complete and seamless all-in-one care for the Windows registry, safely performing the entire battery of critical repair, maintenance, and optimization procedures in one step. This tool also leverages System Mechanic’s technology with more effective problem-detection, improved overall speed and efficiency of scans, and enhanced reporting that provides more detailed scope of errors. - right on your desktop. Provides real-time reports on system health, security, and overall status. Includes a running list of recently performed repairs and optimizations, and offers quick access to commonly used tools, such as Memory Mechanic® and the new EnergyBooster™. 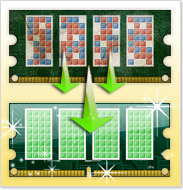 Instantly defragments RAM and liberates resources held captive by memory leaks. 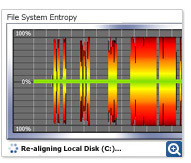 System Mechanic’s Memory Defragmentation tool is designed not only to reassemble your RAM into neat, contiguous order for significant performance gains, but also to hunt down and release all of the resources held captive by memory leaks within sloppy programs. 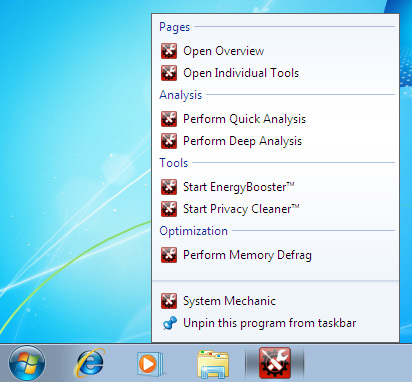 new ways of detecting and removing insidious system clutter, and improved scan speeds. 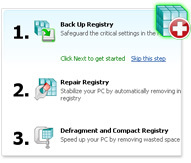 Some of the most important Windows system files such as the page file, the Registry hives, and the master file table, are locked by Windows and can never be defragmented using conventional defragmenting tools, but System Mechanic’s Boot-Time Defragmentation can defragment these special files conveniently before Windows loads. 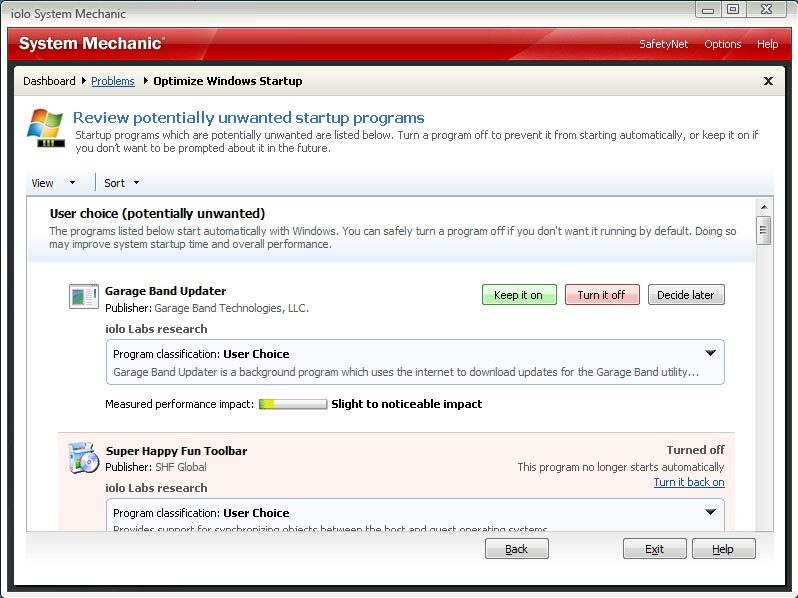 Now, all of System Mechanic’s boot-time operations come with a series of prompts and options that offer you increased control in order to avoid inopportune delays while starting up the PC. You can set up black-out times during the day where no boot-time tasks will be performed, and new prompts at PC startup give you the ability to run or postpone boot-time tasks at that time. A multitude of improvements, enhancements, stability augmentations and general fixes have been incorporated into version 11 for the most effective and reliable performance optimization product to date. Fix, Speed Up and Secure your PC!